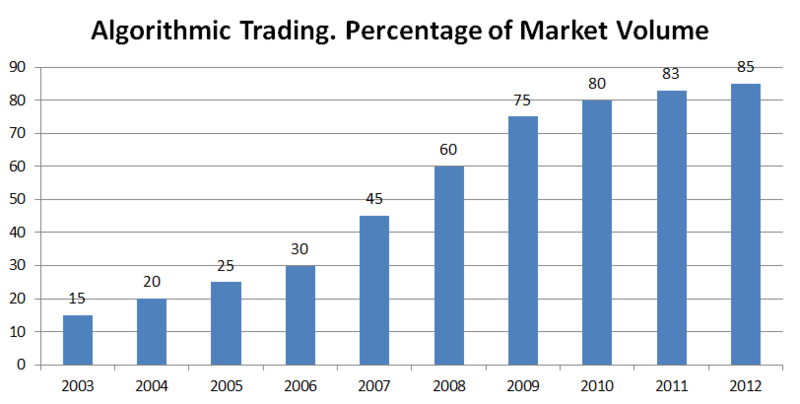 The failure rate of people trying to make money day trading is 90% or more so it must be impossible…right? Although a high failure rate is true, learning to become a successful day trader isn’t impossible. Most people are doomed for failure from the day they start trading due to a lack of preparation. I grossed 783,159.84 in my first two years back when I started day trading over 15 years ago. You can check out some of my real statements by clicking the image below. So what makes me different? Why did I succeed when most traders tend to fail? Can You Make Money Day Trading? Yes! The truth is becoming a successful day trader is just like starting any other business. Most successful traders are relentless workers despite what most people think. Having a plan is critical in determining your overall outcome. Most successful entrepreneurs had a successful mentor to guide them along the way. No matter what your background, there is no barrier to entry when it comes to day trading. Anyone can open a trading account and get started. But, to be a successful day trader, you need more. To get started trading you only need to understand the basics. Things like bid versus ask, different types of orders, candlesticks, timeframes, etc… You can probably grasp a good enough understanding of the markets within a week by doing some simple google searches. Far too often I see traders get caught in what I like to call the “Education Loop”. Most new traders will begin to question their system the second they begin experiencing a drawdown which typically leads to irrational decision making and losses. In life the typical response when you’re failing at something would be to go back and educate and prepare yourself more. Traders tend to get stuck in this constant loop of thinking they need to educate themselves more or improve their trading strategy. In reality, they are constantly trying to educate themselves on the wrong topics. Your overall success as a day trader is determined 80% as result of trading psychology and money management, and only 20% from strategy/system. No matter how amazing your trading strategy is, it’s the execution of that strategy that you need proper training and mental skills for. If you haven’t learned and developed the proper mental skills even the bast strategies will fail. Mental skills include things like; improving concentration and discipline, staying in the moment, and learning to control emotions. Enter shameless plug now. 🙂 You need a mentor. Without my trading mentors at GPC I would most likely have failed early on in my trading career. Some of the most successful entrepreneurs in the world all had great mentors, and trading is no different. If you want to make money trading why wouldn’t you look to someone who has already proven a path to success? Mentors provide the right information and knowledge. In the trading world there is so much education material out there, most which is crap written by failed traders, that you could spend the next 10 years of your life educating yourself. Knowing what is useful and what’s unecessary is key to speeding up your development as a trader. Mentors can spot your strength and weaknesses as a trader. Every individual has certain characteristics that will be beneficial to trading and others that will be harmful. Having an outsider that can see this and train you on how to improve on your weaknesses is a must. Mentors provide motivation. When I started trading at GPC I saw trader’s everyday making thousands of dollars in a few hours. As I got to know them I realized they were normal human beings just like me. It motivated me seeing others being successful and made me confident that I could do the same. If I never experienced this culture, I’m sure after some failures I may have come to the conclusion that trading was impossible and that nobody was successful at it on a short term basis. Mentors create necessary boundaries that we may not be able to set ourselves. Trading is very difficult for most people as it is one of the only environments in the world that has no rules. Since childhood, we are taught rules that ultimately structure who we are in and the world we live in. Stepping into the trading arena where there are no rules can be very difficult for people. A good trading mentor can help you establish rules that are necessary to protect yourself and increase your odds of longterm success. Mentors can prevent you from making mistakes. There’s a hard way and an easier way to becoming a successful trader. The hard way is starting from scratch with no guidance, having to learn from mistake after mistake. I’ve paid for my education, and paid handsomely throughout my career. A good trading mentor can help you avoid some of the most costly mistakes while speeding up your path to success. The trading world is filled with scam after scam. If you’re looking for a mentor the main thing you want is proof that they have traded successfully over multiple years. 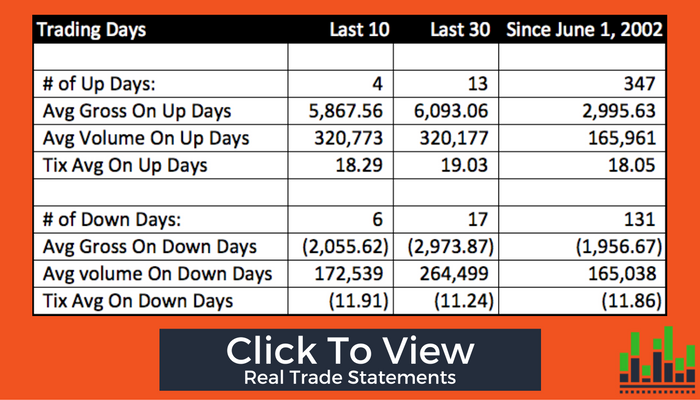 Ask for real trading statements or a published track record. If they can’t provide that you’re wasting your time. I began my trading career trading stocks electronically, primarily NASDAQ, for GPC in Chicago. You can trade any market your prefer but I made the switch to U.S. Index Futures and Forex for the following reasons. Liquidity. Index Futures along with Forex are the most liquid markets in the world to trade. You will have little to no slippage and you can easily increase your size as you prove your trading abilities increasing your upside when compared to individual stocks, especially penny stocks. Lower News Risk. Trading Index Futures makes you less susceptible to risk related to news events. Certain news events for individual companies can cause huge volatility. If you’re ever on the wrong side of one of these trades it could end your career. Tax Advantages. 40% of your gains when trading futures are taxed as ordinary income and 60% are taxed as long term capital gains. Assuming your in a 35% tax bracket this would lower your effective tax rate to 23%. I am not an accountant, so please consult with one. Typically the words futures and options scare most new traders. Rest assured they really aren’t that complicated. No matter what market you ultimately decide to trade, you need to do some basic research on market hours, contract specifications, particular market rules, and understand the underlying forces that impact and drive that market. Learning to build a trading system takes time and experience. For new traders I suggest you learn several systems from other successful traders and adapt them to fit you. Not every trading system no matter how successful it is will be right for you and your personality traits. Knowing that I’m a very impatient person I wouldn’t want to trade a strategy that keeps me in a position for hours at a time. Furthermore, I need a system that gives me an enough opportunities in a day to place a trade. I also tend to perform best in very volatile markets and highly stressful environments. Knowing this about myself, I have developed a strategy that fits my personal characteristics. After you choose a system you need to backtest it and then backtest it some more. Backtesting is not only critical in determining if your system could be profitable or not, but it builds confidence in your system. If you lack confidence in your system you will have poor execution during drawdowns. Proper execution of any business is the result of a solid plan. You need a trading plan that you vow to follow every day. Here are the main topics your trading plan should cover. Learn more about Developing A Trading Plan here. Having an accountability partner is essential to becoming a successful trader. An accountability partner is someone who will help you improve your consistency by offering some guidance, support when needed, and hold you to your commitments. Your accountability partner doesn’t need to be a trading expert but they should at least understand the basics of your strategy and your risk management. Find someone who can be brutally honest with you. It doesn’t serve you any purpose if they are constantly beating around the bush. If you screw up they need to be able tell you that you did. Look for someone who has different characteristics than you. My accountability partner is my brother who is the exact opposite in terms of personality traits. He helps bring a balance to the way I think especially during drawdowns. Be clear about your expectations. To ensure your arrangement is beneficial you have to set expectations early. Are you looking for someone to listen to you or someone to provide feedback. Be clear with them on what you would like to occur when trading is going versus when you’re struggling. Agree on the consequences. If your accountability partner is going to hold you “accountable” you have to have consequences for when you are not doing what you agreed to do. Consequences could include a financial risk or simply having to admit to your wrong doing. As a new trader you should speak to your accountability partner everyday and they should have complete access to all of your trade results. I personally would only recommend a few brokerages. 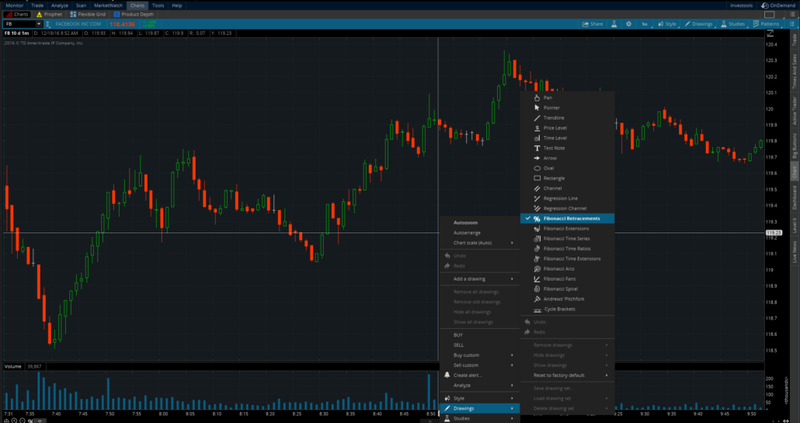 Interactive Brokers IB offers some of the best executions and commission in the business. They also offer every product to trade under the sun. $10,000 minimum to open an account. If you don’t have $10,000 to fund an account I would recommend TD Ameritrade for stocks, options, and forex or Infinity Futures for futures. Prior to ever trading a new strategy you should demo trade your strategy on a live demo account for a minimum of 30 days. Simulation is much different that live trading as emotions don’t come into play because your not trading real money. However, if you can’t make money on a demo account why would you ever trade on a live account? TD Ameritrade offers there ThinkorSwim platform where you can get real time data to demo trade. My answer in none. Essentially this is how I began my career at GPC. I had to prove I could make money on a live demo account prior to them ever backing me with capital. If you’re able to produce some consistent results on a demo account you probably can go to a few family and friends to raise a few bucks. Heck try a company like Kickstarter! WARNING: Trading on a live account isn’t even comparable to demo trading. Don’t think that just because you were successful when trading on a demo account that it will carry over when you begin live trading. As mentioned earlier, 80% of your trading success or failure is a result of trading psychology. Therefore, when trading your strategy on a demo account you were really only practicing 20% of what will determine your overall success. Trading extremely small when you begin will greatly increase your odds of success. Therefore, when you actually do go live you can probably get by starting with $3,000 depending on your strategy and risk parameters. Obviously if you’re trading off longer time frames and your strategy requires larger stop losses then you probably need to start with more capital. You should start by trading the smallest contract size that you can. Example, on the eMini S&P 500 a 1 lot which is $12.50 per tick ($50 per point). If you’re trading stocks start with 100 shares and trade liquid stocks with tight spreads. Do not trade money you can’t afford to lose! You will lose money, it’s part of trading, especially as a newer trader. Trading money you can’t afford to lose will lead to irrational decisions resulting in you blowing up your account. Overtime by evaluating your performance you will be able to improve your strategy and execution. When I began my career I was a Level II trader purely making decision off of order flow. In 2007 more and more algorithms began to enter the market lowering overall market transparency This made it more and more difficult to find opportunities as a level II trader. 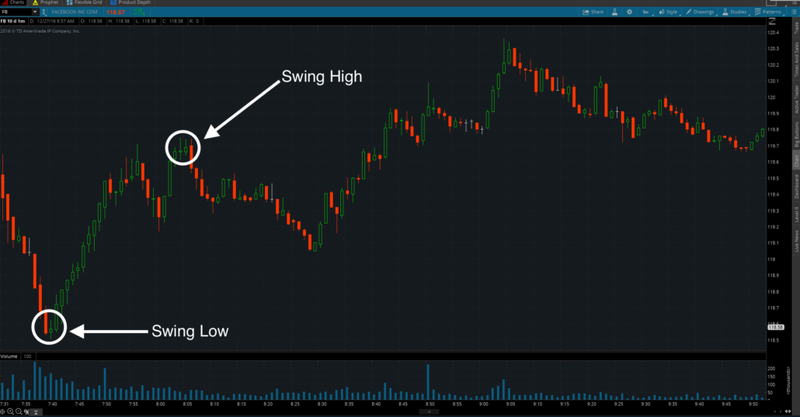 I then found an arbitrage opportunity in the Forex market with retail brokerages and was able to exploit that opportunity for a few years before it disappeared. As with any business, you must be able to adapt to the new landscape or you will die. Ask the floor traders that never made the transition to electronic trading how they’re careers are going. Simply put, never get comfortable. The second you do you’re in trouble. Constantly be researching new ideas and evaluating what others traders you look up to are doing. 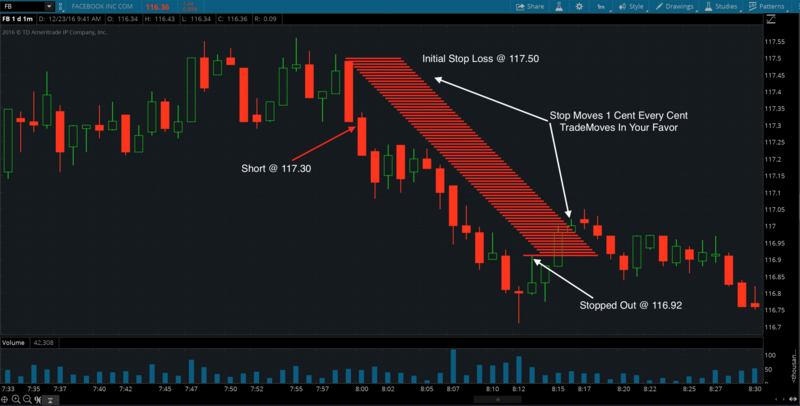 After reading this article you should have a solid foundation and understanding of what it takes to make money day trading. Becoming a successful day trader won’t happen overnight, so in the meantime don’t quit your day job just yet. Preparation is where the hard work comes in, your actual trading should be effortless. Having gotten to this point on a long article shows you may just have the commitment that it takes to make money day trading. What areas have you struggled with and what have you done to improve? A Fibonacci Retracement (Fib Retracement) is a popular tool used by technical analysts to find potential support and resistance levels. 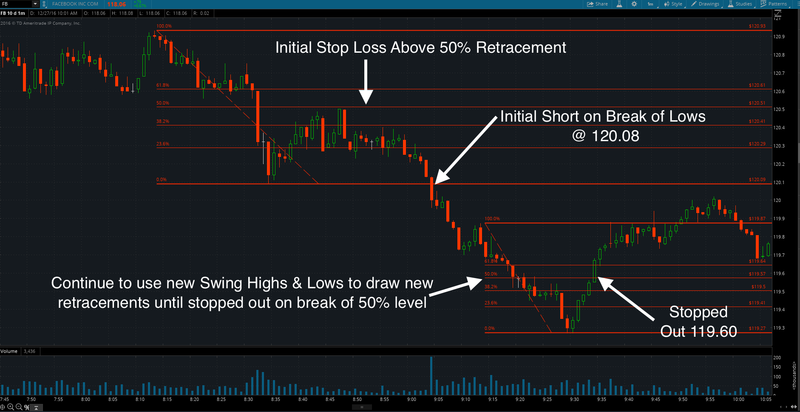 Fibonacci retracements are great for determining where to enter a position, place stop losses, and define profit targets. The ratio was founded by mathematician Leonardo Pisano, nicknamed Fibonacci. Leonardo discovered a series of numbers that created ratios found to exist repeatedly in the natural environment and the universe. This series is derived by starting with 0 followed by 1 and then adding a number and the number to it’s left to get the third number. You repeat this sequence to build the series. After the first few numbers in the sequence if you dived a number by the next number in the sequence you get .618. For example, 34 divided by 55 equals .618. If you measure the ratio between alternate numbers you will get .382. For example, 21 divided by 55 equals .382. These ratios are considered to be the “golden mean”. You can search and read all about these ratios existing in nature, but for our purposes this is enough. Why do the fibonacci ratios work when used in trading? Could it be some magical ratio that exists in the markets? Sure…but at the end of the day it doesn’t really make a difference. I believe that a large enough population of traders look for these retracements and extensions and use them in their trading. Thus why they work. The most commonly used fibonacci retracement levels are 0.236, 0.382, 0.500, 0.618, and 0.764. The 50% retracement level is not derived from a fibonacci ratio. However, it is commonly used and was made popular by Charles Dow, found of Dow Theory. The 50% retracement levels is the most influential level where key reversals and trend continuations occur. Fib Retracement Levels are tend to work best after a significant move in a trending market. As price begins to retrace after a significant move these levels tend to form the areas of support. 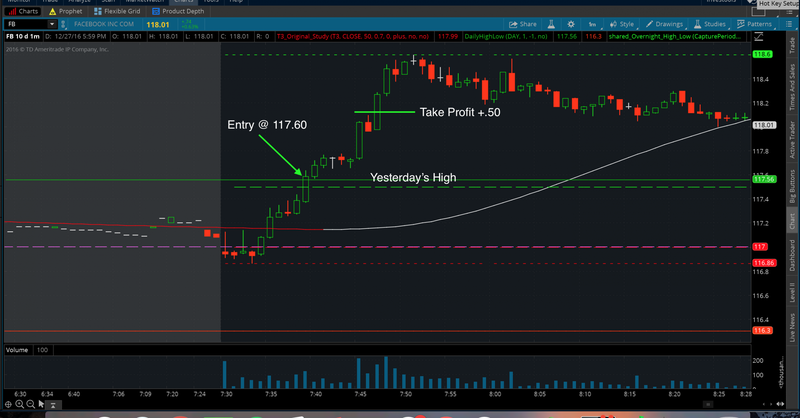 On the chart below of Facebook, you can see we had a significant up move on the open. Price began to pull back and consolidate before moving higher. Notice how price moved down to the 50% retracement level and then bounced continuing the strong uptrend. Note, these retracement levels should be considered zones more so than an exact price. Like all support and resistance levels sometimes price will breakthrough the level slightly prior to the rejection. Not all fibonacci setups work! Like any good trading strategy, you should include multiple other confirmations when looking for a setup. 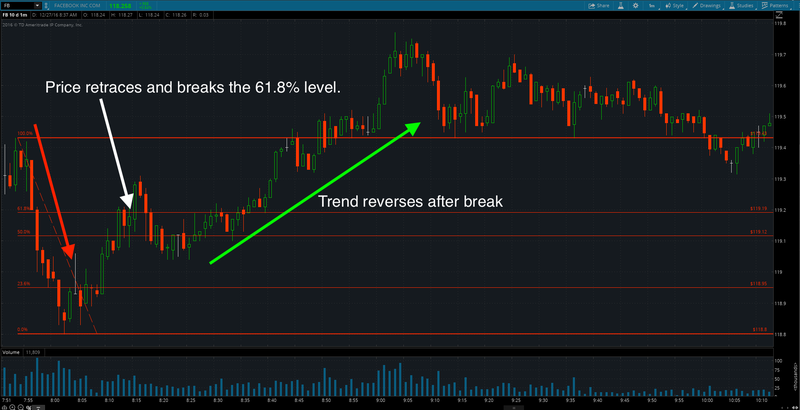 Most traders consider a break of the .618 retracement a sign of a trend reversal. Thus why a lot of Fib traders will place there stop loss order behind the 61.8% retracement when they are trading using fib levels. On the chart above of Facebook (FB) you can see the initial downtrend and retracement back to the 50% level and the eventual break of the 61.8% level. The market reverses and the downtrend ultimately fails. In order to find and draw fibonacci levels you have to find the most recent swing high and low. Begin by identifying the most recent swing low and high as seen in the chart below. Next, find the fib retracement tool on your charting platform. You can find the retracement tool on the Think Or Swim platform by right clicking on your chart and going to drawings and selecting fibonacci retracements as seen below. 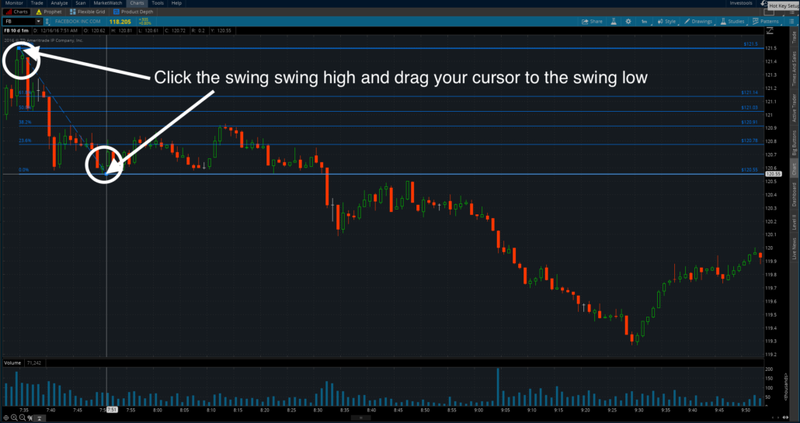 Once you’ve selected the Fib tool you will click on the swing low and drag your cursor to the swing high as seen below. Notice on the chart below how price broke through the 23.6% retracement level and initially finds support at the 38.2% retracement level. 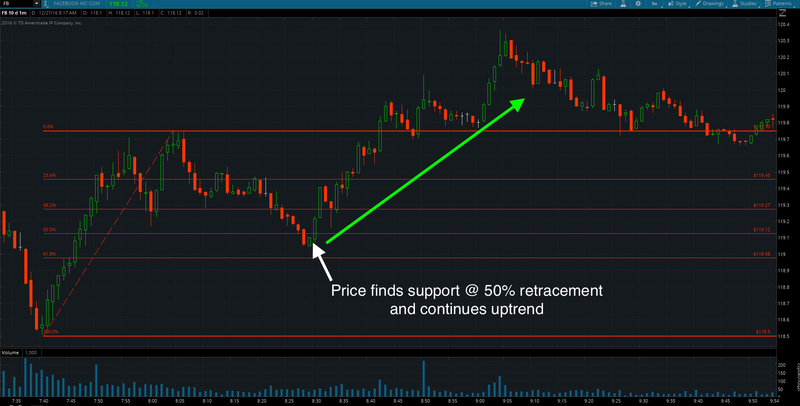 Eventually the 38.2% level also failed and price retraced down to the 50% level finding support and resuming the rally. Using Fib lines in a downtrend are similar to an uptrend. 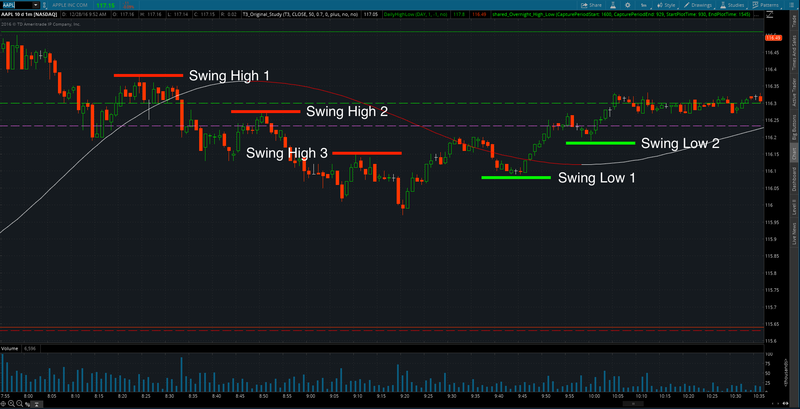 Begin by identifying the swing high and swing low. After you’ve identified the swing high and low choose the fib retracement tool on your platform and click the swing high and drag your cursor to the swing low as seen above. 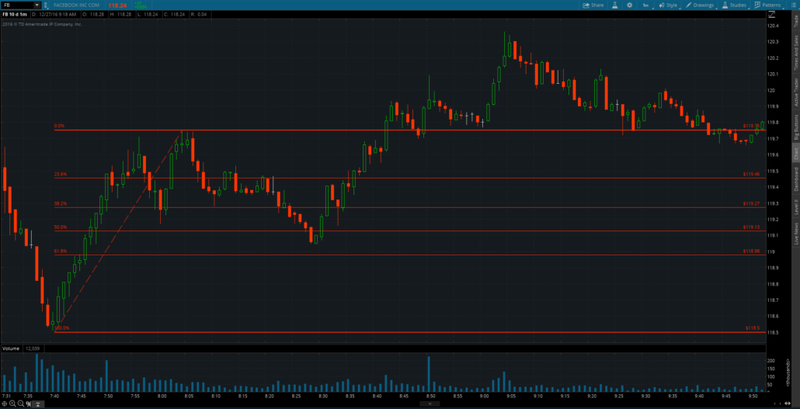 On this setup Facebook broke to new lows and retraced slightly to the 23.6% level. It consolidated for sometime between the lows of the day and the 23.6% level until a test of the 38.2% which was rejected and the downtrend continued. 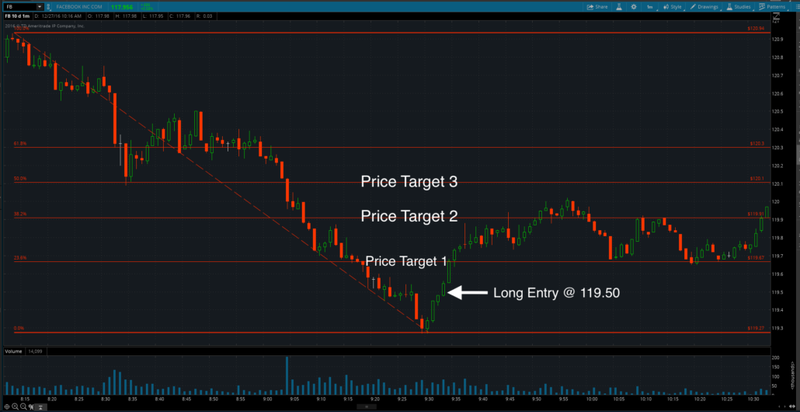 Now that you have an understanding of Fibonacci Retracements lets take a look at how you can implement the use of fib levels into your trading. 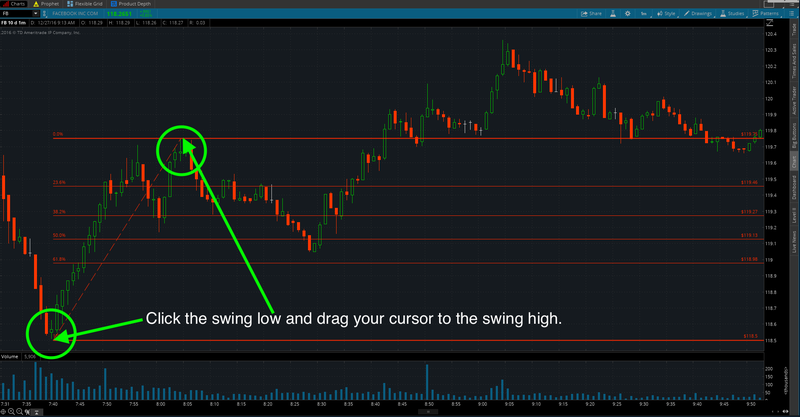 No matter your trading strategy, you can use price holding at a fib retracement level as an additional confirmation to enter a trade. Let’s assume you use trend lines, as seen in green below, to look for potential entries and trend continuation after a rejection of the trend line. As discussed before, the 50% level tends to be a level where strong reversals occur followed by the continuation of the overall trend. 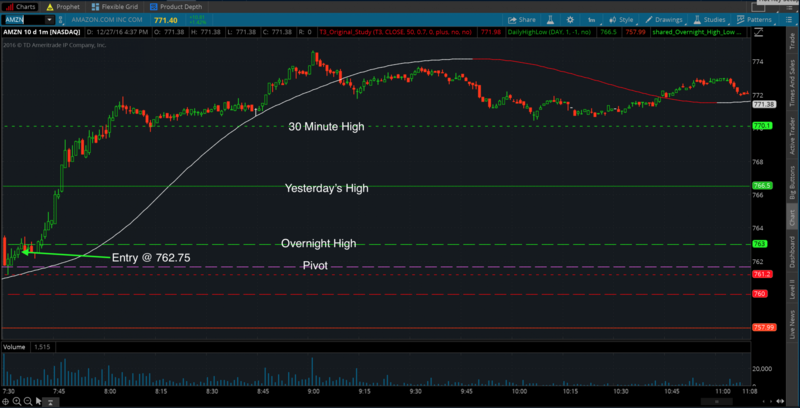 In the above example you can see Facebook rallied and price was rejected from going higher at not only the trendline but the the 50% retracement level as well. This would have been a great entry to get in on the overall continuation of the downtrend. You can use the 50% retracement as an additional confirmation not only for trend lines but for double tops and bottoms, moving average crossovers, and much more. No matter what your trading strategy, you can use fib levels to determine logical stop loss points. Assume you were looking to short Facebook on a break of the lows. As can bee seen on the chart above you could have placed your initial stop above the initial 50% retracement level. As the trade moves into your favor and new swing highs and lows form you can continue to draw new retracement levels. You would continue to do this until you are eventually stopped on the break of a 50% retracement. On the chart above you can see this would have happened at $119.60. Whether you’re a trend or counter trend trader you can use Fib Levels to determine where to begin taking profit on a winning trade. 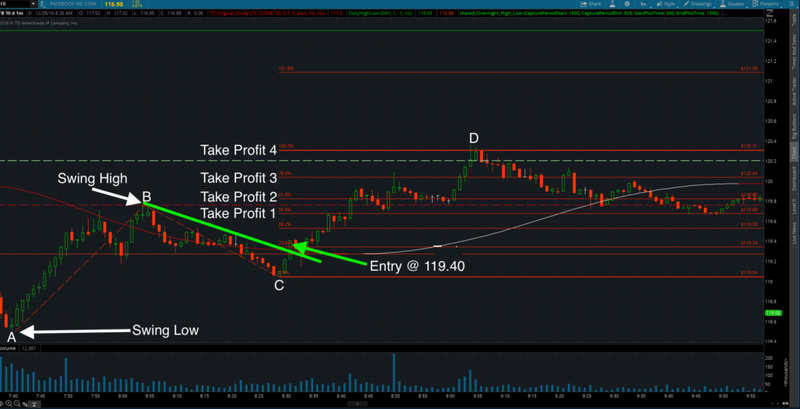 Let’s assume you’re countertrend strategy signaled for you to go long Facebook at $119.50 as seen in the chart below. You can use the 23.6%, 38.2%, and 50% levels to begin to piece out of portions of your position. 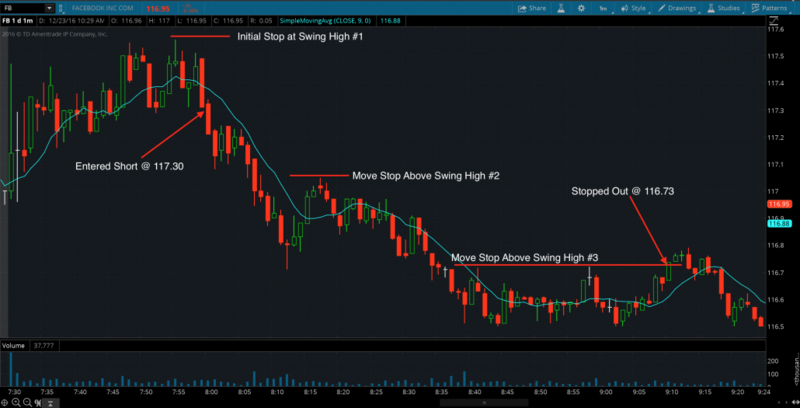 You can also use these levels to manage your stops as the trade goes further in your favor. 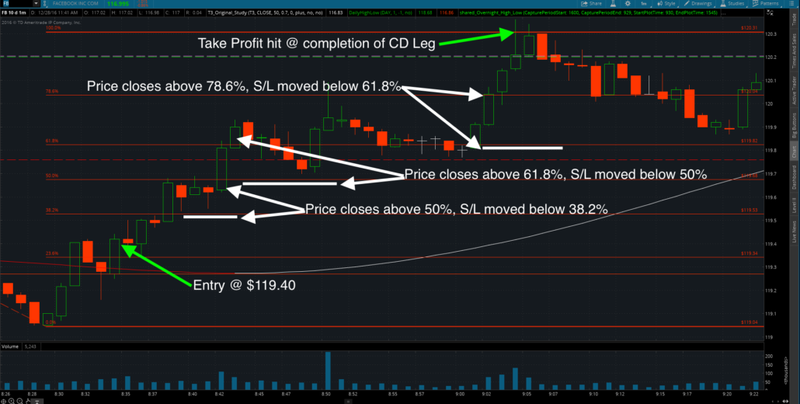 For example, after Price Target 1 was hit you could move your stop loss to break even. 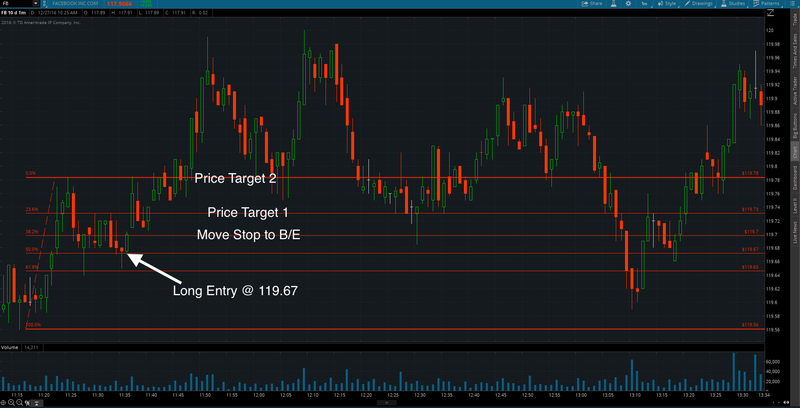 After Price Target 2 was hit you could have moved your stop loss below Price Target 1 where you would have been stopped out on this trade. As mentioned earlier you can also use Fib levels if you’re a trend trader. 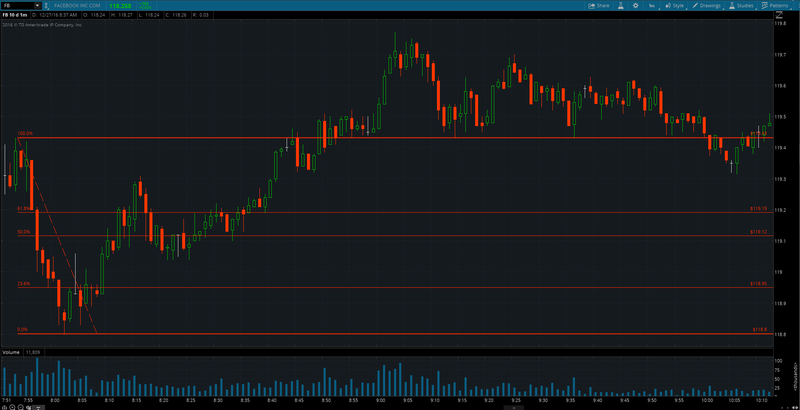 Let’s assume you decided to go long Facebook at 119.67 after the 50% retracement level showed signs of support. 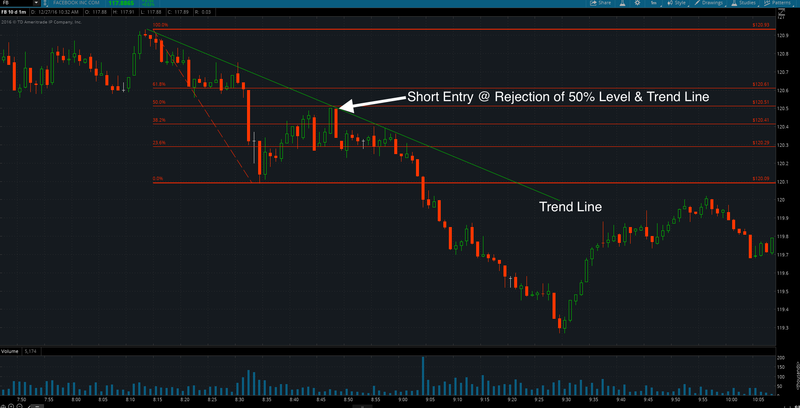 After price breaks back above the 38.2% retracement level you move your stop loss to break even. 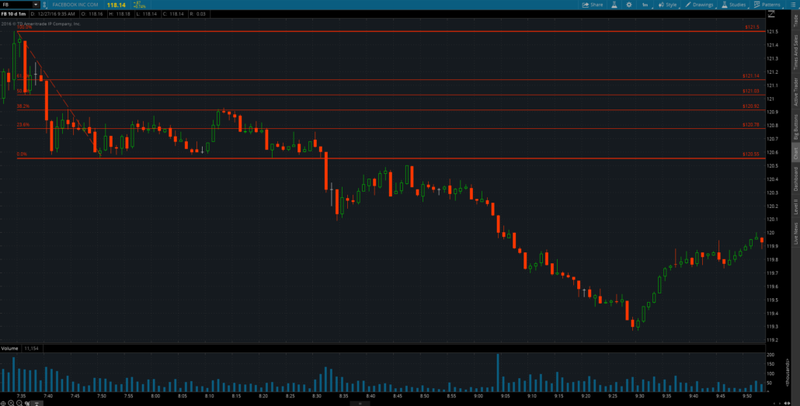 You begin to piece out of your winning trade at the 23.6% and 0% retracement levels. Potentially you leave on a third of your position for a runner. As you have just learned, Fibonacci Retracement Levels are great for determining key areas of support and resistance. Try implementing them with your current trading strategy and let us know what you think. (NOTE: Want to learn how we use Fib Levels to trade and all the rest of the tools you’ll need to become a consistently profitable trader? Become a JT Member for Free. Click Here.